I am very honoured to have been chosen as a second round judge. Valentina from Valentina's Room and Aarti from Booklust made their selections and now it is my turn to make mine from their choices. Jameela and her family live in a poor, war-torn village in Afghanistan. Even with her cleft lip and lack of educational opportunities, Jameela feels relatively secure, sustained by her Muslim faith and the love of her mother, Mor. But when Mor dies, Jameela’s father impulsively decides to start a new life in Kabul. Jameela is appalled as he succumbs to alcohol and drugs, then suddenly remarries, a situation that soon has her a virtual slave to a demanding stepmother. After she’s discovered trying to learn to read, Jameela is abandoned in a busy market, eventually landing in an orphanage run by the same army that killed so many members of her family. Throughout it all, the memory of her mother sustains her, giving Jameela the strength to face her father and stepmother when fate brings them together again. Goodreads. In short...there is an interesting degree of distance created between the reader and the soldiers in this novel. It makes the story less black and white, less political and more focussed on the protagonist, Jameela, who draws upon her mother's memory to propel her through some pretty harsh situations. Despite it's short length it packed an emotional punch but didn't entirely resonate with me. –10 points for obsessing about Asher Richelli, who talks to Nina like she’s not a freak at all, even though he knows that she has a disturbing line of hair running down her back. Goodreads. In short...I really responded to both the self-consciousness that pervaded this novel and the humour that joined it. Life is both light and dark and I think Karim found a way to make Nina's concerns, the reader's concerns. She's a highly relatable character regardless of your own cultural identity and I think that why I responded to this one so well. One of my best friends is Muslim and Nina reminded me of her so much that I wanted to talk to her straight away. The humour is what sold me on Karim's story and made me choose it over Khan's Wanting Mor. Ohhhh these sound really, really good. I haven't heard of either of them, though. I'll have to keep my eyes open for them or order them online if they aren't available in the US. Thanks for sharing!! Thank you for being a judge and participating in Nerds Heart YA. 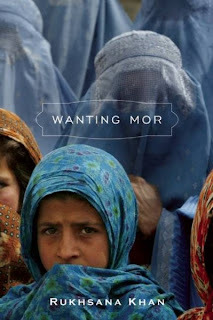 Wanting Mor is on my wishlist. 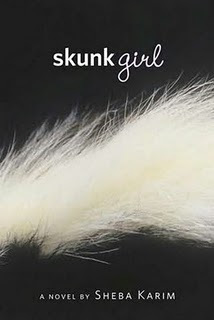 I really liked Skunk Girl. Nina is so relatable and I loved her sense of humor throughout the novel. I could relate to her low self esteem at times as well. Thanks so much for working with NHYA. Still very excited about the contest. They both sound extremely interesting. Great choise in the end! Competition is getting tougher though!